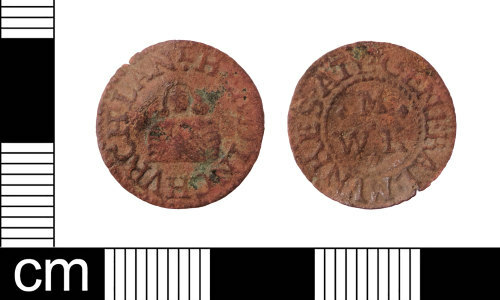 A complete English Post-Medieval copper-alloy farthing trade token dating from AD1648-1674. Williamson (1889:566 636). Demensions: diameter: 16.01mm; weight: 0.65g. Reference: Williamson, G. C. 1889. Trade Tokens Issued in the Seventeenth Century Vol I. Elliot Stock: London.